#kinsale – After a cancellation last Sunday the ASM Frostbite series came back with a vengeance today. Conditions were described as exhilarating, varying and challenging with race officers reporting winds of between 3 and 25 knots at different stages. The windward mark under Moneypoint proved very problematic with little or no wind to round the mark. The gusts proved too hard for many of the 4.7 and Radial Lasers with numerous retirees and no shows. However the Squib fleet and the Full Laser Fleet embraced the challenging conditions to hotly contest race placings. At the end of the days racing in the Squib fleet, Allegro (Colm Dunne & Rob Gill ) were placed first on 8 points with Lazurus (Colm Daly & Marcus Hutchinson) following closely with 11 points. KYC Commodore Finbarr O'Regan and his son Colm were lying third in their squib Fagin on 18 points. 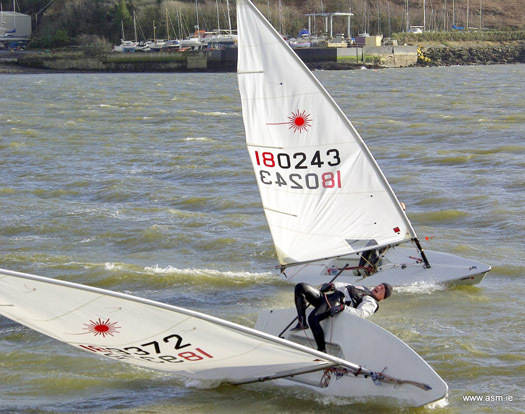 In the Full Laser fleet Sean Murphy (KYC) leads on 11 points, James Long ( Inniscarra) lies second on 15 points followed by Ian Travers (KYC) on 19 points. There was only 2 competitors in the 4.7 Laser fleet with Billy Duane (RCYC) claiming all the bullets and Ben Hunt (KYC) taking second place. Racing continues next Sunday 9th.